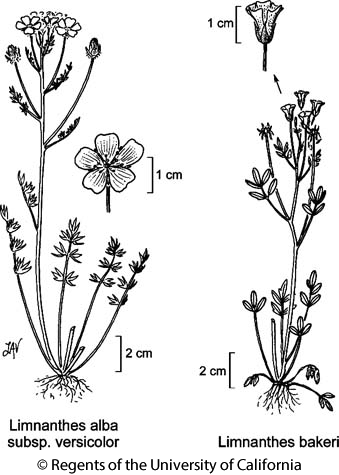 Habit: Erect or ascending, herbage glabrous. Stem: 10--40 cm. Leaf: < 10 cm; leaflets 3--9, elliptic to ovate, entire or lower occasionally 2--3-lobed. Flower: funnel- to bell-shaped; sepals 5--7 mm; petals 7--9 mm, pale yellow with white tips, reflexed outward in fruit; filaments 2.5--4 mm, anthers 0.5 mm, cream; style 2--3 mm. Fruit: mericarp tubercles dense, short, wide. Ecology: Vernal pools, marshy lake and stream margins; Elevation: < 500 m. Bioregional Distribution: c NCoRO (near Willits, Mendocino Co.). Flowering Time: Apr--May Note: Threatened by development, grazing. Citation for this treatment: Robert Ornduff & Nancy R. Morin 2012, Limnanthes bakeri, in Jepson Flora Project (eds.) Jepson eFlora, http://ucjeps.berkeley.edu/eflora/eflora_display.php?tid=30970, accessed on April 19, 2019. No expert verified images found for Limnanthes bakeri. c NCoRO (near Willits, Mendocino Co.). Markers link to CCH specimen records. Yellow markers indicate records that may provide evidence for eFlora range revision or may have georeferencing or identification issues. Purple markers indicate specimens collected from a garden, greenhouse, or other non-wild location.